AccTech was among a global field of top Microsoft partners recognised for demonstrating excellence in innovation and implementation of customer solutions based on Microsoft technology. In addition to winning the 2018 Microsoft Hybrid Cloud Solutions Award, AccTech Systems was recognised as a finalist in four categories: "Microsoft SA Managing Directors Award, Business Applications ERP Partner of the Year, Hybrid Cloud Platform Partner of the Year and Best Go to Market Execution Partner." AccTech Systems, a 4Sight Group company, has won 2018 Microsoft Hybrid Cloud Solutions Award. Tertius Zitzke, AccTech Systems CEO, commented: "We are incredibly proud to be the recipient of the Microsoft Hybrid Cloud Solutions Award. 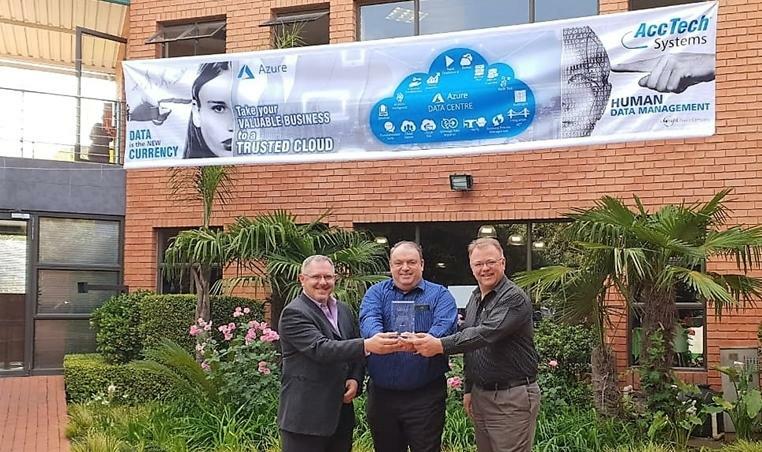 It is an outstanding achievement for AccTech Systems to be considered as a key driver of Microsoft Cloud offerings in South Africa, with the Azure data centres opening towards end of 2018 in South Africa." "Our investment into the Microsoft Azure technologies and integration capabilities into ERP and other hybrid systems has certainly paid off." AccTech joined the 4Sight Group as a result of the group's digital transformation focus; and expertise in the other affiliated companies. This, coupled with AccTech's association with Microsoft, allows it to deliver on this vision. 4Sight Holdings CEO Antonie van Rensburg is honoured that the 4Sight Group has been recognised as a leader in digital transformation. "It is in line with the group's growth strategy; Industry 4.0 and digital transformation is the DNA of our young group," says Van Rensburg. The Microsoft 2018 South Africa Partner of the Year Award recognises partners at a country level that have had substantial growth in their customer base and/or revenue by driving customer impact and satisfaction with Microsoft Cloud offerings. The winner demonstrates that it has secured effective engagement with its local Microsoft office and demonstrates innovation, competitive differentiation, and customer value that results in a profitable business that showcases the benefits of using Microsoft Cloud services and technologies. AccTech Systems joined the Microsoft Echo System in 2007. In 2009, AccTech was the recipient of the International Microsoft Newly Recruited Partner of the Year as well as the South African Microsoft Mobility Solutions Partner of the Year. Over the past decade, AccTech has received numerous awards , including the Microsoft Country Partner of the Year for SA in 2014, Microsoft Dynamics ERP Partner of the year finalist and two wins since 2014, to name but a few, demonstrating AccTech's dominance in the ERP and CRM arenas. Winning the Hybrid Cloud Perform Partner of the Year Award: recognises a partner that has Microsoft capabilities that enable customers to modernise their data centres by taking advantage of advances in hybrid capabilities. Finalist for the Managing Directors SA Award: recognises a partner that has over-achieved in one or more areas important to Microsoft and the IT industry and is aligned with Microsoft SA's key FY18 priorities and strategic direction. This partner has achieved ground-breaking wins in one or more of cloud, lOT, digital transformation, mobility, business applications, and App Dev categories and competencies in high growth areas such as Azure consumption. Finalist for the best Go to Market Execution Partner, award recognises the partner that generated the most opportunities in co-marketing investment with Microsoft Partner Marketing Advisor. This partner is aligned to Microsoft SA and its key FY18 priorities and strategic direction, with competencies in high growth areas such as Azure Consumption, O365 Active Usage and CRM Online. Finalist for the ERP Partner of the Year Award recognises a partner that excels at providing innovative and unique sales, services, solutions, and/or support based on Microsoft Dynamics ERP, including the Dynamics AX, GP, NAV, or SL product lines. Winning new customers, customer satisfaction, growing your business, innovation and local relevance. AccTech Systems, a 4Sight Holding's company, is a professional services firm that partners with customers to run their enterprises efficiently and effectively through the deployment of best-of-breed business solutions. Since its inception in 1994, AccTech has grown to be a world leader in the field of enterprise resource planning (ERP), customer relationship management (CRM) and IOT. If you are a modern business, the ripple effect of a newly implemented business solution could easily unbalance your organisation. AccTech's ability and experience to predict and manage these effects is what sets AccTech Systems apart from its industry peers.